Bus from Klang to Hat Yai is the most economical and convenient transportation option as compared to flight. Overnight bus is especially popular because travellers spend the journey sleeping in the bus and arrive Hat Yai in the morning. 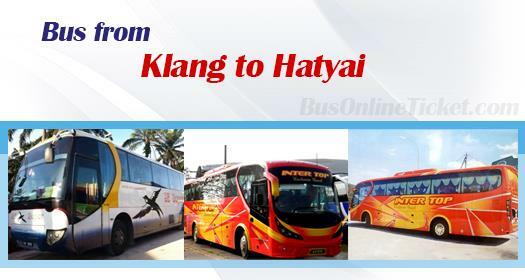 SE Super Express and Hatyai Intertop Express are the only two bus operators serving bus services from Klang to Hat Yai. The bus operators offer total 4 daily trips from Klang to Hat Yai. Out of these 4 trips, only 1 departure in the morning 915am and the other 3 departures are in the night. That is because overnight coach is always the preferred travelling time. The bus ticket from Klang to Hat Yai is sold at prices ranging from RM 63.00 to RM 65.00 depends on the choice of bus operators. The duration required for bus from Klang to Hat Yai is about 11 hours depending on traffic and climate condition. Washroom break is provided upon request along the highway because all buses in Malaysia has no toilet available in the bus. Passengers are reminded to bring along jacket for overnight coach because the air conditioning is very cold in the night. The boarding point for bus from Klang to Hat Yai is located at Terminal Klang Sentral. Terminal Klang Sentral is located at Jalan Meru, Klang. Both operators terminate the service at their shop counter located at Hat Yai town area instead of Hat Yai Bus Terminal. Hat Yai Bus Terminal is meant for Thailand local express bus. Passengers are advised to book ticket online in advance with BusOnlineTicket.com especially during the weekend and holiday season. Planning for a chill weekend to Hat Yai? Hurry up and book your bus ticket online now from our portal BusOnlineTicket.com or via mobile app which can be downloaded for free on App Store or Google Play just a fingertip away!